It doesn’t matter if you take off your shoes the moment you step in the door. It doesn’t matter if you keep your house spotless — some allergens will make their way inside. (After all, they are nearly invisible.) Once those allergens — dust, pollen, dander, microscopic mold and other organisms — find their way in, gravity pulls them to the floor. There, they become trapped in and around carpet fibers. Granted, this reduces the opportunity for those nasty little things to circulate in the air, where you can breathe them in and suffer a perpetually runny nose, but every step on that carpet sends tiny clouds of particles back into the air. The good news is that people with allergies and asthma can have carpet. Most fibers used in mass-produced rugs and carpets today are harmless materials like polyester and nylon, the same stuff clothes and bags are made out of. These synthetic blends are constructed out of lab-developed fibers that repel allergens, in part because they are nonorganic and offer an inhospitable climate. For example, mold has nothing to eat and pollen dries out. Nylon is the most effective allergy-controlling carpet fiber. Wool, conversely, should be avoided because allergens and mold can thrive in it. Regardless of material, avoid shag — the shorter the strands, the fewer places the pollen can go. Also choose carpet with tightly woven strands for the same reason. 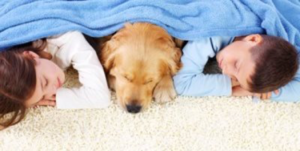 Although we might not normally associate carpet with improved indoor air quality, it does have a very positive effect. Gravity causes common household particles, such as dust, pollen and pet and insect dander, to fall to the floor. Carpet fibers trap the particles, removing them from the breathing zone and reducing their circulation in the air. Proper cleaning with CRI-approved vacuums effectively removes dust and allergens from the carpet and helps keep them out of the air we breathe. When carpet is kept clean and dry, mold simply cannot grow on synthetic fibers. Carpet is recognized as one of the lowest emitters of volatile organic compounds among various flooring choices and interior finishes. 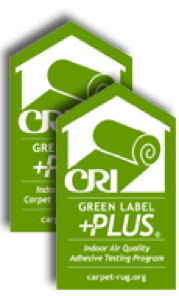 The Carpet and Rug Institute’s Green Label Plus Indoor Air Quality Standard identifies carpet, adhesive and cushion products that meet or exceed government indoor air quality regulations and are the lowest emitting products on the market. \arpet has the lowest volatile organic compound (VOC) emissions of common flooring choices. In fact, it’s one of the lowest emitting products used in new construction and renovation. What VOCs new carpet emits are short-lived and largely dissipate within 24 to 48 hours – even faster with fresh air ventilation. The manufacturer voluntarily participates in the program. The manufacturer is committed to developing ways to minimize any adverse effects on indoor air quality. A representative sample of the product type is tested by an independent laboratory and meets the established emissions requirements. Carpets and rugs provide better traction than other flooring options, preventing falls. This is true everywhere, but even more important in areas where there is a lot of rain and snow. And when falls do happen, the softer surface reduces their impact. Whether you are in a business, school or hospital, fewer falls and less severe injuries are one more reason carpet is a choice you can feel good about. Carpet is significantly more efficient at reducing noise, compared with other flooring. So everyone from employees to students gets a quieter, less distracting environment where they hear more, concentrate better and perform their best. FACT: Multiple scientific studies have concluded that carpet fibers, in trapping and immobilizing potential allergy-causing particulates, can actually help people with allergies. If allergens are in the carpet, they’re notcirculating in the indoor air stream. Shaw recommends using a HEPA-filter vacuum to fully remove such particles from the indoor environment. Carpet acts as a trap for allergens and is capable of holding significant quantities of soil, dust and other substances. The carpet holds on to the particles until you are ready to remove them. Regular vacuuming, using a high-efficiency filter and periodic hot-water extractions, removes the majority of allergens. To learn more check out our Breathe Easier article and a paper, “Carpet, Asthma and Allergies – Myth or Reality” by Dr. Michael Sauerhoff, Ph.D., DABT. Carpet emits harmful chemicals that cause health problems? FACT: Carpet is one of the lowest emitters of VOCs (volatile organic compounds) among househld furnishings and building materials. Shaw carpets meet the industry’s highest VOC standard, the Carpet & Rug Institute’s Green Label Plus program.